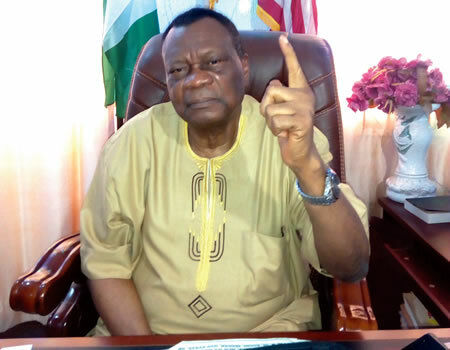 Despite his retirement from active service as the General Evangelist of the Christ Apostolic Church (CAC), Prophet Samuel Kayode Abiara, has kept the flame of Christianity aglow. He has been proving that God’s work has no limit. In this interview with NIGERIAN TRIBUNE , the renowned cleric speaks about life after retirement and the qualities of clerics. There is feverish preparation for the general election in Nigeria, with accompanying tension and apprehension in many quarters. As one of the most revered clerics in the country, what would be your message for Nigerians at this auspicious time in the history of the most populous black nation in the world? The first thing we must make our priority this year is to always thank God in all ramifications as individuals and as a nation, especially for His mercies and ensuring peace in Nigeria, despite all its challenges. The act of gratitude does not exempt the authorities of the country and all top government functionaries, both at the federal and state levels, because Nigeria is our home. Secondly, 2019 is a year of happiness, grace, blessings and peace, especially for those that are closer to God. Also, all the promises of God for their lives would be fulfilled. According to Job 22 VS 21-27. If we want to experience the blessings and wonders of God this year, we must move closer to Him and live a righteous life. I want to urge every sinner to turn a new leaf, because wrath will come upon every unrepentant sinner and the wicked this year. All corrupt people must repent and terrorists around the world must lay down their arms, in order not to face God’s anger and be exposed. Do you have any fear over Nigeria, in view of the anxiety among a lot of Nigerians at the threshold of the elections beginning on February 16? God owns Nigeria and everyone that dwells in it. So, no one should be distracted or entertain any fear concerning the coming elections, because Christ is the ‘Prince of peace’. John 14 VS 1 says: Do not let your heart be troubled. Trust in God and believe in Him. There won’t be any problem whatsoever; there will be peace before, during and after the elections. So, Nigerians should not be bothered about the uncertainty of peace in the nation as a result of the elections. God is behind us. I want to strongly advise those that may be planning to disrupt the peace of the election to be careful, otherwise they will face God’s instant judgment. God is watching and the international bodies are watching too. All candidates and politicians at large must be very careful and comport themselves well in the forthcoming election, because it is not a do-or-die affair. All politicians must have the fear of God and ensure the elections are peaceful. The future of Nigeria is bright and good. This is why every Nigerian must be interested in the peace and progress of the nation. We must collectively move the nation forward and take it to its rightful place. So, every Nigerian, including Christians and Muslims, must go out en masse to vote for the progress of our dear nation. Everyone that loves the nation must vote based on their conscience in the election. You must have some experiences concerning your transformation from the exalted status of the general evangelist to the equally revered position general evangelist for all denominations globally. How has it been? First, I want to acknowledge the leadership of the Christ Apostolic Church (CAC). The church is dynamic and the administration is superb. After retiring as the general evangelist of CAC based on the constitution of the church, I have been able to take my calling to a global level. I am now opened to all churches. It is not as if I don’t honour invitations from other churches before my retirement, but I am now free for all denominations to pray and preach the gospel. Even before I retired, God gave me a vision to take my empowerment programme, Abiara Divine Foundation (ADF) Worldwide, to a greater level. The initiative is part of my service to humanity, especially for the underprivileged, the aged, orphans and widows. This is to give hope to the needy by empowering them in various ways. We have extended our gestures to many remote areas. We are currently making provision that a lot of people benefit the programme. The programme is not a jamboree, but a commitment to create a sense of belonging as a true Nigerian; this is how we can collectively show love and make the country a better place. Are you saying that you have not fully retired from the vineyard? I may have retired from active service of the CAC, but I am still very much active in the work of God. You can see that my office is filled with people and I just returned from a programme in Lagos. We held a three-day power-packed programme for men and women on Friday and Saturday in Ibadan. So, I can never retire from God’s assignment. How would you describe activities of your successor, Prophet Hezekiah Oluboye Oladeji, since he assumed office? God appointed him and he has my support. I pray for him every day, because he is my successor and I want him excel more than I did. In fact, I pray for all clerics and prophets, irrespective of denominations around the world every day. That is my job and this is how we can help ourselves spiritually. I always have every cleric at heart every day. So far, he is really trying, though I know that it is not easy. CAC is not a mushroom church. I spent a decade as one of the leaders of the church. It is my delight that the church has witnessed a tremendous progress under its present leadership. The church remains one of the best in the world. We are deep-rooted in prayers and vast in the word of God. Importantly, we are always sensitive about revelations or prophesies. Instead, we organise programmes to avert any problem or disaster. It is interesting that you are sensitive to prophecies. A number of other clerics have come out with various scary prophesies on personalities and the country at large. How would you reconcile that to stance? The Bible is clear on this issue. This is why I always encourage clerics not to embarrass the leaders and the country as a whole with prophesies of doom. Instead, they should organise prayers for them. The only way to identify whether a prophecy is true or not is through the Bible. Meanwhile, God has anointed true clerics to comfort and pray for people and not otherwise. How did you come about the Abiara Divine Foundation? The giveback programme has been part of me for a very long time. I have been doing this in my own little way from youth. God told me a long time ago that my life is useless if it is not affecting people positively. This is a mandate from God and I thank God for giving me the grace to yield to the call. He even gave me the name, Abiara Divine Foundation (ADF). So, this is how I have been able to connect with the needy. Also, it is a legacy I want to leave behind. Through the foundation, we have been able to empower people with vehicles, shelter, food and material things. It is becoming bigger now, because it has been registered and we are launching it formally. Thereafter, we will be holding the programme three times in a year. We are focusing majorly on remote areas. I want to use this opportunity to appeal to well-meaning Nigerians and even the government at all levels to generously support the programme because I cannot do it alone.